Have you surveyed your members recently? Governor Carlos has asked all clubs to make Membership their Number 1 priority. Healthy, vibrant and growing clubs require that all members feel they have a voice in the club. Conducting regular member surveys is one way to improve member satisfaction in Rotary and increase member retention. There are many tools, hi and low tech, available to help. Rotary International has created a membership satisfaction survey, which is included in a handbook of club assessment tools. You can download a paper copy of the survey here. It’s designed to be completed in less than 15 minutes. The District can also help you conduct this survey with your club via Zoomerang, an online survey tool. Here's a preview of the survey on Zoomerang. Contact Club Service Advisor Rich Lalley for assistance. An even easier way is to ask members to fill out a very brief meeting feedback postcard after each weekly meeting. The card would ask members to rate the meeting on a 5 point scale and answer two timely questions: “How do you feel about our club ________?” and “Will you _______?” Each week your club can fill in the blank with a timely issue. You can download a word file here and print off the cards using Post Card stock from an office supply store, or simply print them on copier paper and cut them into four cards. Best practice would be to conduct a thorough satisfaction survey (unless you recently have done so) and do weekly meeting feedback cards. 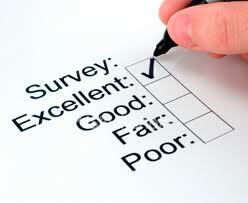 Let us know how your member surveying goes, what you learn and how it helps your club.